This is a fascinating and imaginative programme of choral music. On the face of it, these four composers writing in the 1940s might be thought to have a great deal in common. Yet the youngest and oldest � Britten and Pizzetti � were born more than thirty years apart, so that their musical outlook was fundamentally different. 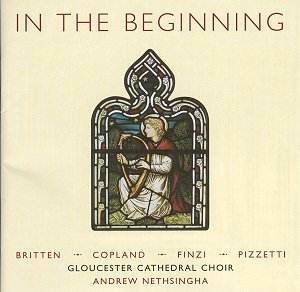 Equally, Britten, Pizzetti and Finzi were steeped in the vocal traditions of their countries, while Copland, of Russian Jewish extraction, was somewhat less at home with the choral medium, though that in itself gives his In the Beginning a freshness of approach which is very engaging. Gloucester Cathedral Choir is a spirited and characterful ensemble, served by a trio of superb musicians � director Andrew Nethsingha, organist Robert Houssart and voice coach Russell Burton. There is no doubting their commitment to this music or their comprehension of it. However, I feel that they have not been well served by the recording in this instance. Avie seem to have gone for ambience rather than detail, and the effect is rather like sitting towards the back of the cathedral. You get a wonderful sound seated in such a position, of course, for the music washes over you in great waves. But this is far from ideal for complex, fast-moving music such as the Britten and Copland pieces. In places like Let Nimrod, the mighty hunter (track 1, 1:33), the quieter entries of the chorus can�t be heard clearly, a problem further complicated by the slight lateness of the choir (possibly caused by time-lag between them and the organ). A similar result can be heard (minus organ of course) in In the Beginning (track 10) around 6:00. The Pizzetti and the Finzi, being inherently slower-moving and less rhythmically active, are more successful. However, the trebles of the choir sound thin, and their blend is less than ideal. They are obviously trying to develop a clarity of tone at Gloucester, which I applaud, and is certainly preferable to the �hoot� that used often to be heard in this country. But going for a more focused sound can put the blend and intonation of your trebles under the microscope, and in this case, unfortunately, they are often found wanting. The extreme chromaticism of Pizzetti highlights this, while the lack of sufficient weight of tone in the top line is a particular problem in the Copland (which in any case, was conceived for the adult SATB voices of Harvard University). On the plus side, the Britten has some delightful solo contributions, notably James Gilchrist�s serene For the flowers are great blessings. And the ensemble achieves a spine-tingling and massive sound for the climax of For I am under the same accusation as my Saviour, in which poor Christopher Smart�s words give voice to the dark depths of his paranoia. This, and the intensity achieved in Pizzetti�s fine Ululate and equally in Finzi�s moving Lo, the Full, Final Sacrifice speak of the imagination and commitment that is always evident in the music-making here. Frustratingly, though, I can�t say that this CD makes the most of the choir�s sterling qualities and high potential.